Since most Microsoft users aren’t developers or have any real interest in developing, the Redmond company limits the amount of opt-in features for geeky Windows fanatics. One of the upsides available to anyone interested in Windows and who is running the latest MS Windows 10 is getting Insider Preview updates if you enable the feature. If that sounds cool to you, follow the guide below to learn how to enable Insider preview Build updates for Windows 10. 1. Open the Settings app by pressing the Windows key + 1. 2. Navigate to Update and Security. 3. Click the Advanced Options link from the Windows Update section. 4. Scroll down the page with the mouse and stop when you get to “Get Insider Builds“. 5. Click the “Get Started” button that’s available directly beneath the Insider Builds heading. 6. Sign in using your Microsoft account from the next screen. 7. 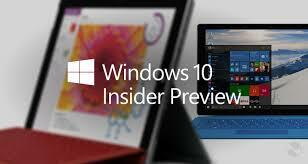 Follow the set of instructions Microsoft dishes your way to to begin receiving Insider Build updates. Voila! You can now test out the one waiting and have access to any future updates. If there’s one problem you face during this guide it’s likely to be having a grayed out “Get Started” button. To solve the said issue, simply navigate your way to Privacy > Feedback & Diagnostics > click menu beneath Send your device data to Microsoft and choose “Enhanced/Full” from the menu. Now navigate out of there and try again.